Sen. Cory Booker, D-N.J., visits Masterpiece Barber College as he campaigns for Nevada Democratic candidates in October in Las Vegas. Sen. Cory Booker of New Jersey is the latest Democrat to enter the increasingly crowded race for the White House, making the initial announcement with a message of unity. "We are better when we help each other," Booker says in a video message. "I believe that we can build a country where no one is forgotten, no one is left behind; where parents can put food on the table; where there are good-paying jobs with good benefits in every neighborhood; where our criminal justice system keeps us safe instead of shuffling more children into cages and coffins; where we see the faces of our leaders on television and feel pride, not shame." The video sets the tone for a campaign that's expected to counter President Trump's divisive, base-focused politics with a conscious emphasis on big-picture themes of common purpose and love overcoming political divisions. Booker's goal, he told NPR in 2017, is "not to meet hate with hate, but meet it with love. Not to meet darkness with darkness, but meet it with light. I really do think we're at a moral moment in our country. The only way we can move this country in the way it needs to go is not at pointing other people about what they're doing, but turning up the values we believe in." 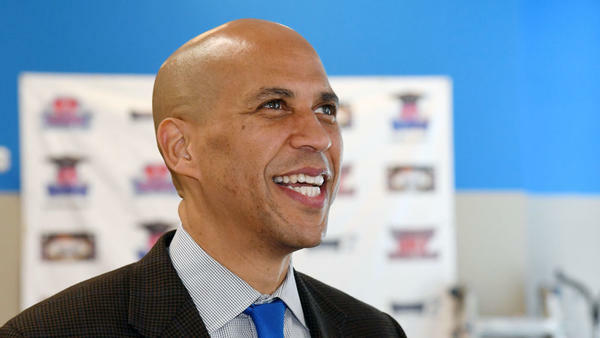 Booker planned a series of media appearances as part of his rollout on Friday, including The Tom Joyner Morning Show, Univision's Despierta America and ABC's The View. The 49-year-old Booker, a former Newark mayor who was first elected to the Senate in a 2013 special election, has long been seen as a likely candidate to challenge Trump. He made it apparent he was likely to run with a couple of strategic moves, joining the Senate Foreign Relations Committee in 2017, as well as making frequent trips to early primary voting states such as Iowa and New Hampshire to raise money and campaign for local candidates in the 2018 midterm elections. His trips left a positive impression with several political professionals in the early primary and caucus states. Jim Demers, who co-chaired Barack Obama's 2008 New Hampshire campaign, told NPR that Booker has "built his career on a message of unity. And I think that people all across the country are tired of how divided Americans have become." Even before he was elected to the Senate, Booker had amassed a national following as Newark's mayor, primarily due to his early embrace of Twitter and other social media platforms. He attracted attention to causes such as homelessness and shortcomings of the federal food stamp program by going on hunger strikes and temporarily living in a tent, among other highly publicized moves. Booker also regularly interacted with constituents on Twitter. When someone tweeted that her elderly father needed help shoveling his driveway, Booker showed up to do it. He also once ran into a fire, saving a woman's life while suffering smoke inhalation and burns. Booker has continued this approach in the Senate. During the height of the Republican push to repeal the Affordable Care Act, Booker drew attention to the debate by holding a sit-in on the steps of the Senate with other Democrats, and livestreaming the event for hours. Those efforts have, at times, backfired. During the Supreme Court confirmation hearings for Brett Kavanaugh last fall, Booker dramatically threatened to release confidential documents from Kavanaugh's time in the Bush White House, even though, as he claimed, "the penalty comes with potential ousting from the Senate." Booker called it his "Spartacus moment," but the drama was significantly deflated when it became clear that the documents in question already had been approved for public release. In the Senate, Booker has been a strong advocate of overhauling the criminal justice system. He was an original co-sponsor of the First Step Act, bipartisan legislation passed in December that addresses drug sentencing and rehabilitation for inmates leaving prison. He was also one of the first senators to call for legalizing marijuana. Booker is an advocate of Medicare for all, raising the federal minimum wage to $15 per hour and a job guarantee program. He's also been a strong opponent of Trump's Cabinet appointments. While his savvy on both social and traditional media earned him a high profile, Booker also has faced criticism from progressives for appearing too close to both Wall Street and pharmaceutical companies, a major industry in New Jersey. And as a surrogate for the 2012 Obama campaign, Booker admonished Democratic criticism of GOP nominee Mitt Romney's business career, saying: "Stop attacking private equity." In 2017, Booker told NPR that he stopped taking donations from the pharmaceutical industry, previously a prominent source of his campaign funds. In recent years he has co-sponsored a measure, along with Sen. Bernie Sanders, I-Vt., to legalize pharmaceutical imports from Canada, and has been increasingly more outspoken about high drug prices. The New Jersey Democrat is the fourth senator to announce a run for president, joining Sens. Elizabeth Warren, Kirsten Gillibrand and Kamala Harris. Booker is the second black candidate in the increasingly large and diverse 2020 Democratic primary field. Booker and Harris have worked together on the Senate Judiciary Committee and have a close relationship but are expected to compete for the support of African-American voters — a key constituency in a Democratic primary. Senator Cory Booker is the latest Democrat to make it official. CORY BOOKER: Together we will channel our common pain back into our common purpose. Together, America, we will rise. I'm Cory Booker, and I'm running for president of the United States of America. MARTIN: The New Jersey senator made a name for himself as the mayor of Newark. He is the fourth senator to run for the Democratic nomination, and he probably will not be the last. That's a safe bet. NPR's Scott Detrow is covering the growing 2020 presidential campaign and joins us in the studio. Good morning, Scott. SCOTT DETROW, BYLINE: Good morning. MARTIN: We had expected this. Cory Booker had been hinting not-so-subtly that he was interested in a presidential run. What is his message out of the gate as he launches? DETROW: You know, so far, candidates like Kamala Harris and Kirsten Gillibrand, two other senators running, are framing themselves as fighters, people who will stand up to Donald Trump. Booker is taking a different tact. That's been a big part of his political career. He certainly can be confrontational. Anyone who saw him in the Brett Kavanaugh confirmation hearing saw that. But Booker has long stuck to big, sweeping themes like unity, common purpose, a sunny, positive approach most of the time. He seems to be making a bet to the pendulum theory of politics here that after years of President Trump being divisive and focused on the base, that Americans would be interested in the opposite approach. MARTIN: So what are some of the challenges that he's going to face? DETROW: Well, first of all, you mentioned it's a big field that's going to keep getting bigger. Booker has been a high-profile Democrat for years. He was on Hillary Clinton's shortlist for vice president. For a long time, there's been a flip side to Booker's high media profile. There's been a lot of progressive skepticism of Booker, especially as the party has gotten more populist. He's from New Jersey, and therefore, he's had close relationships with big industries in that area - Wall Street, the pharmaceutical industry. DETROW: That's something that comes up a lot from his critics. Booker has sponsored bills to legalize drug imports from Canada in recent years, among other steps, but that's something that that always comes up from the critics. MARTIN: As we note, he's going to have to distinguish himself because there are a lot of folks who have also thrown their hat in the ring - a lot of his Senate colleagues. How does he do that in such a large field? DETROW: It's a great question. For a long time, Booker has distinguished himself on social media. Before President Trump made Twitter central to his political identity, Booker did - of course, in a very different way. You may remember back when he was mayor of Newark - you know, responding to requests from constituents, like, hey, can you come shovel my driveway? And he'd show up and do it and post about it on Twitter. DETROW: He's kept that up in the Senate. I'm curious to see how that translates to a national campaign. He's carved out a very progressive space in the Senate, pushing for marijuana legalization, criminal justice reform. He played a big role in the law signed a couple months ago - guaranteed jobs plan. But of course, most of the candidates running have very progressive stances. Booker's entrance highlights what a large field it is, but also how diverse this field is. Of the four U.S. senators running, you have three women and one African-American man. None of the four U.S. senators running are white men at this point, and that is certainly very different from centuries of American presidential politics. MARTIN: Right. So speaking of that - Joe Biden, Bernie Sanders. When are we going to hear from them? DETROW: That is the big question. You mentioned that we expected Booker to enter the race - same with a lot of the other candidates who entered. Biden - there's a big question of whether or not he's going to do it, and Bernie Sanders, increasingly, as well. There are questions of, does he run again, or does he sit - play a kind of a kingmaker role now that so much of the party has been molded in his policy image? MARTIN: All right. NPR's Scott Detrow. Thanks so much. We appreciate it, Scott.